Hi there! 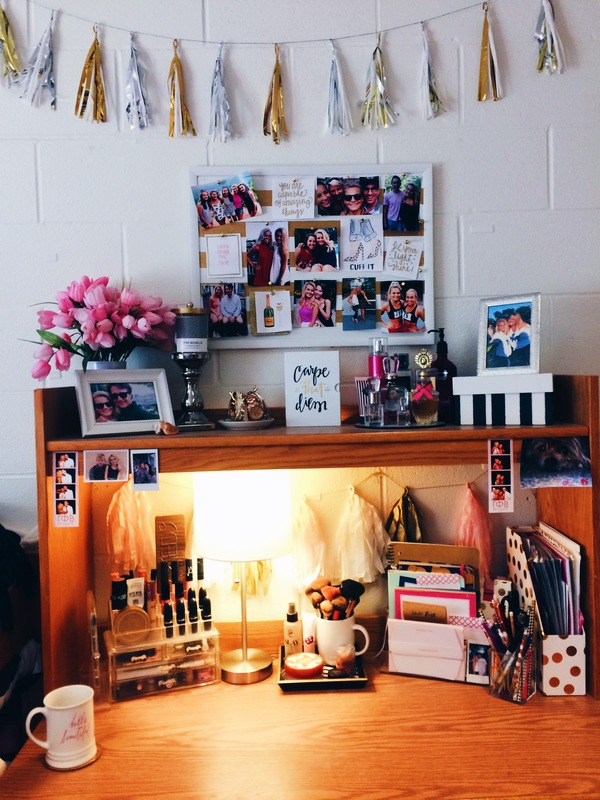 Today I would like to share with you how I decorated my dorm room for my sophomore year of college as well as some organization tips! 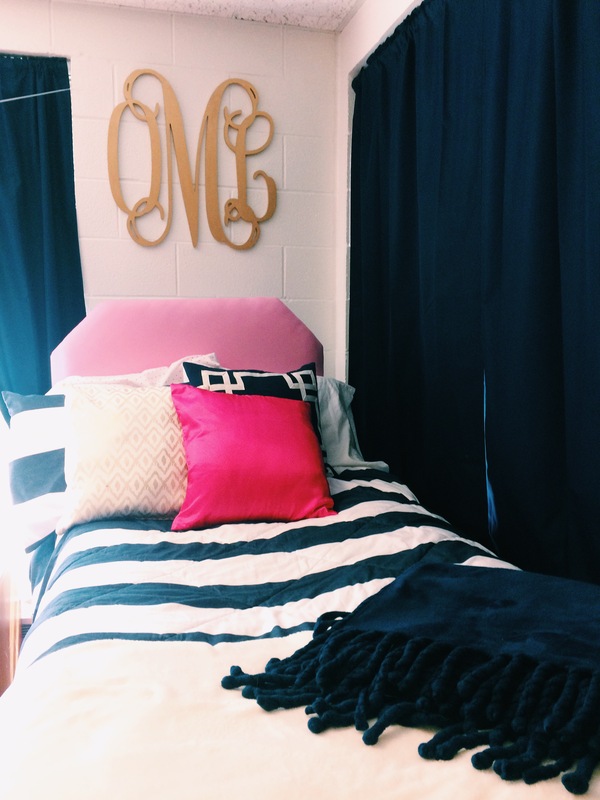 My roommate and I wanted our room colors to be pink, navy blue and white. We put together a really fun and bright room and I can’t wait to share it with you! My wall monogram was purchased from Etsy for only $18!! It came unpainted so my roommate and I painted them gold! My bedding is from target and my throw pillows are from T.J. Maxx. 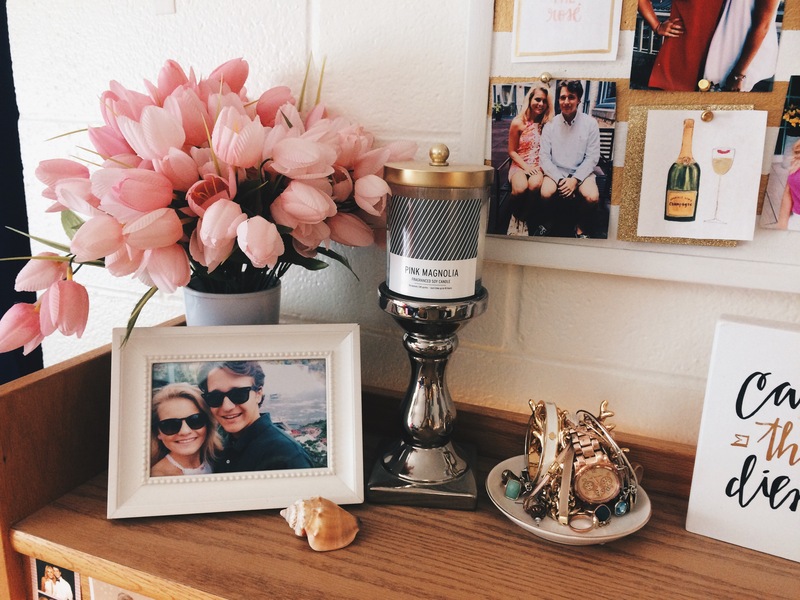 My desk was one of my favorite parts of my dorm room. It where I do most of my work so I wanted to create a space that was bright and colorful that would give me inspiration. I also wanted to create a functional space as well. 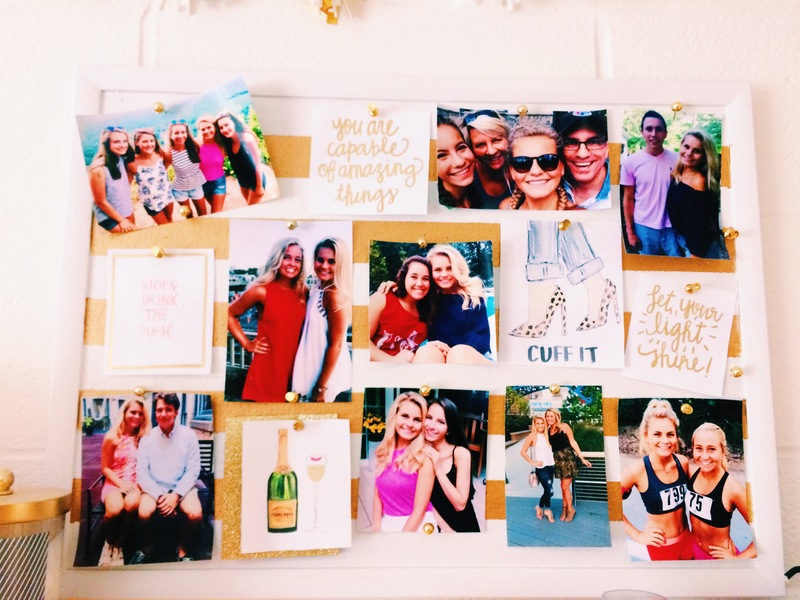 My DIY cork board is sure to look fantastic is any room. I bought the plain cork board from Target, then gave it a make over with some gold and white paint. 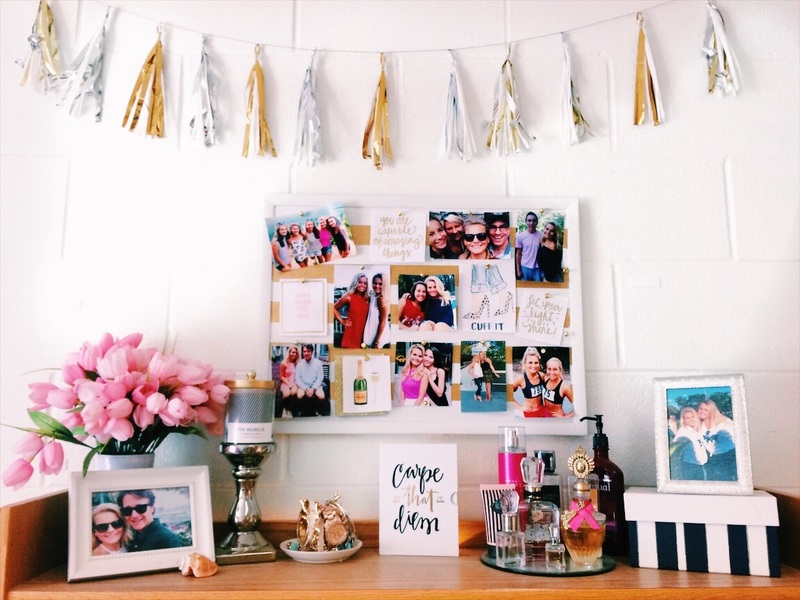 Fill it with your fav pics and quotes and you have yourself a little inspiration/memory board! Like I said, I wanted my room to be function just as much as it could be pretty to look at. 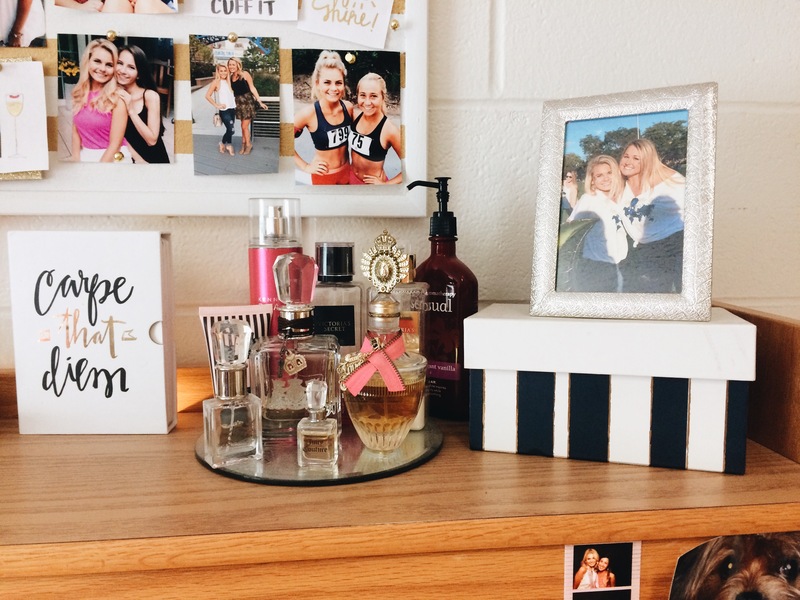 I used a mirror to place all of my perfume on and a decorative box to hold all of my nail polish, functional and pretty!! 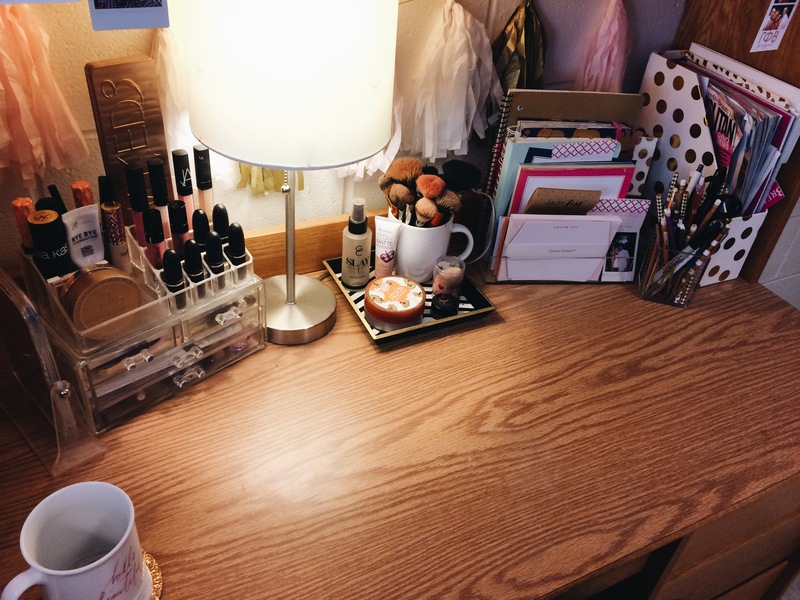 This is my desk that I doubled as my vanity. I wanted to make my desk very functional but also very cute. 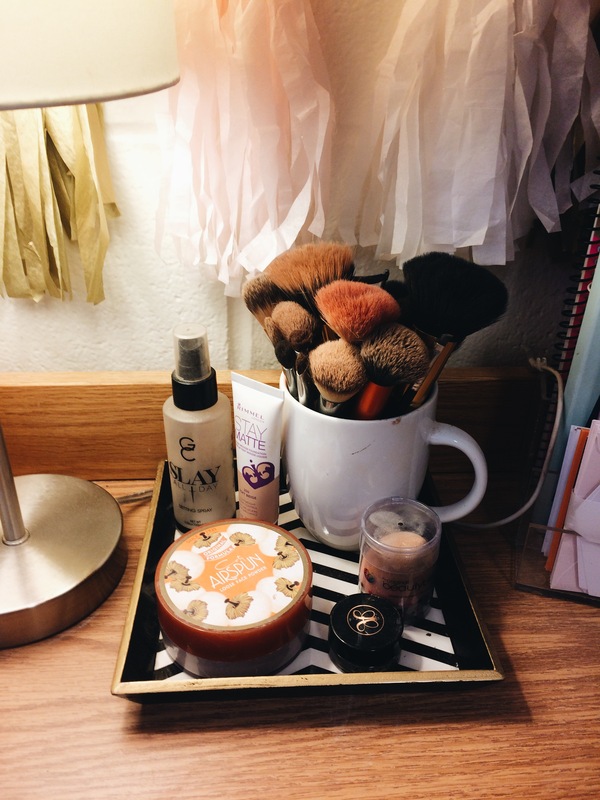 The left hand side is all of my beauty items and the right side of my desk held all of my school related items. 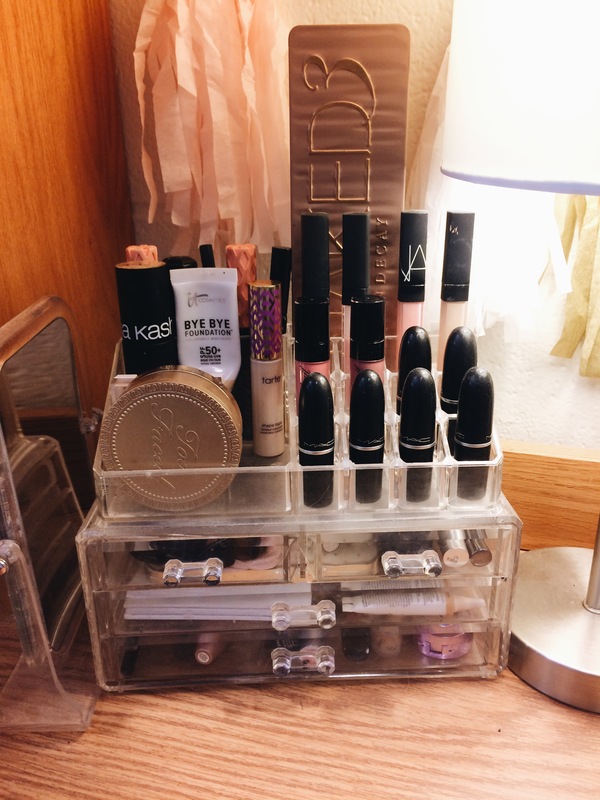 I love these clear makeup organizers because they look so pretty and do a great job in organizing my make up. I am a bit of a makeup enthusiast so I also had a smaller decorative tray to hold my brushes, powder, and other items that wouldn’t fit in the organizer. 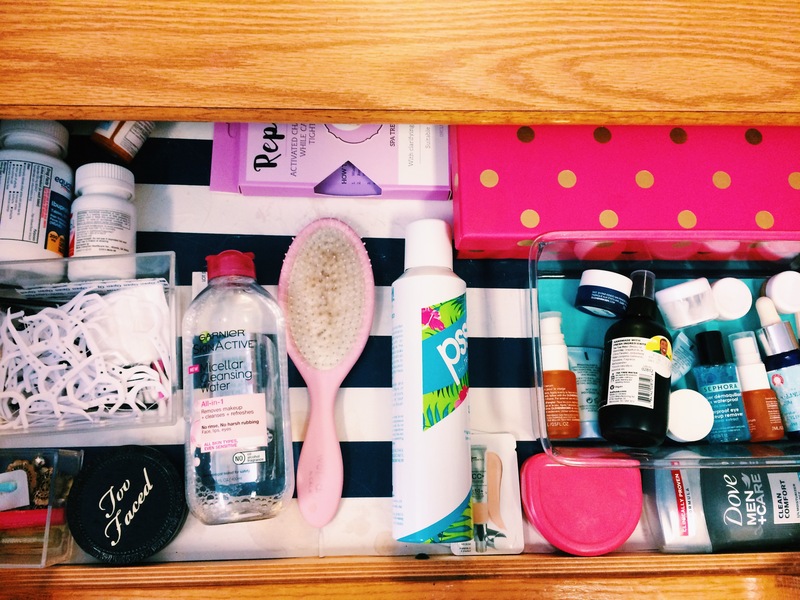 This drawer is where I keep more beauty items, what a surprise. This clear container is from target and I kept all of my skincare in there! I also kept most of my hair care items in this drawer as well. Here is a picture of the kitchen and by that I mean the mini fridge and microwave. 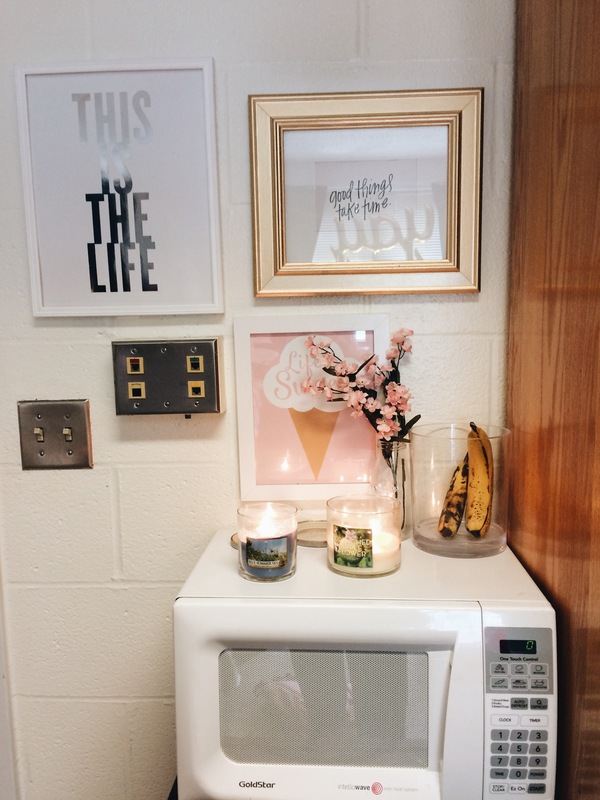 We jazzed it up a bit by adding candles and picture frames. YAY! 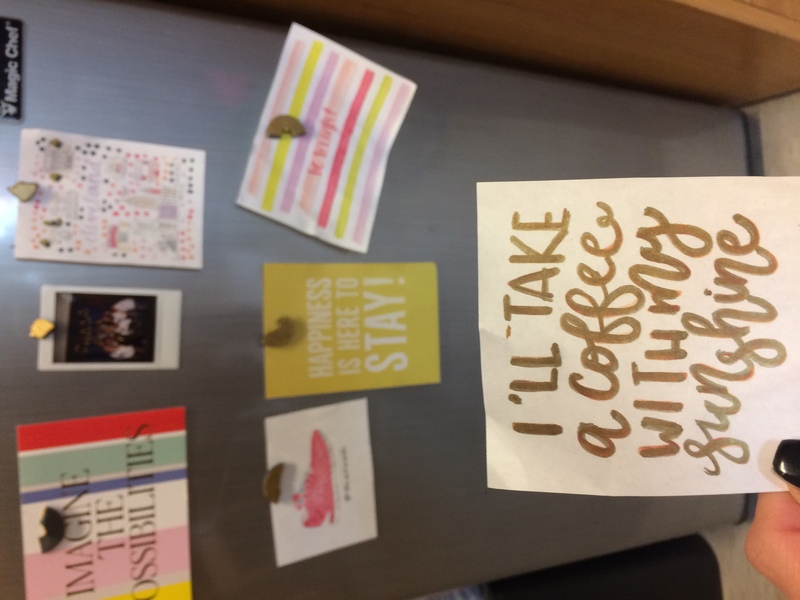 My my fav place, the coffee station. 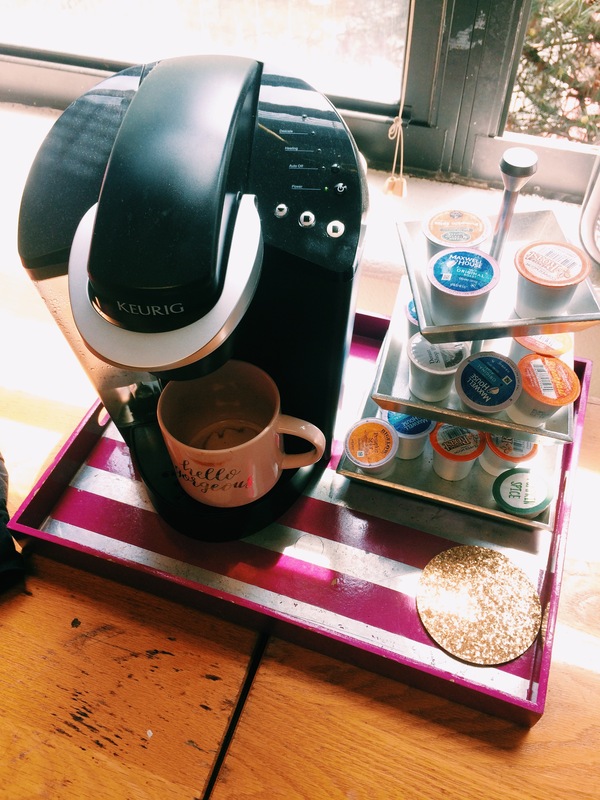 I bought the tray and k-cup holder from Hobby Lobby and painted them to match the room. We have sparkly gold coaster to protect the luxurious dorm room furniture lol. 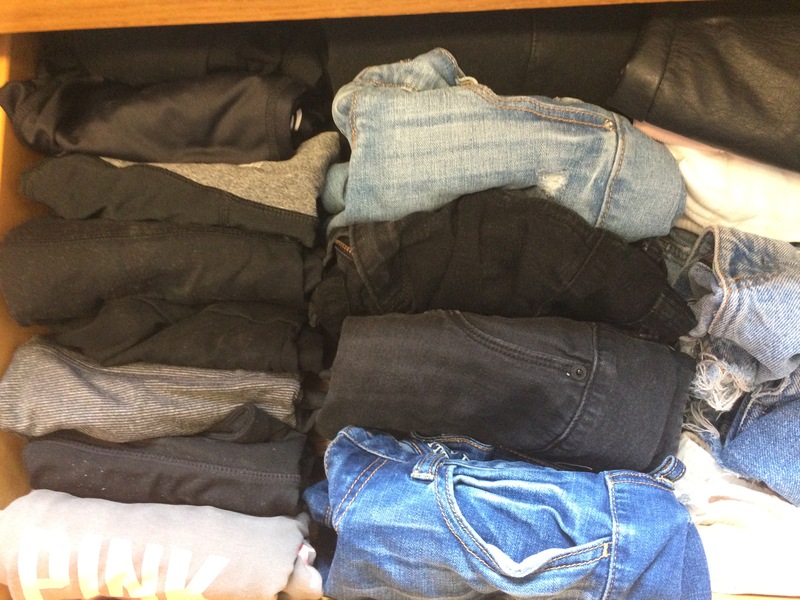 One of by biggest tips would be to roll your shirts and pants to fit in your drawers like so. 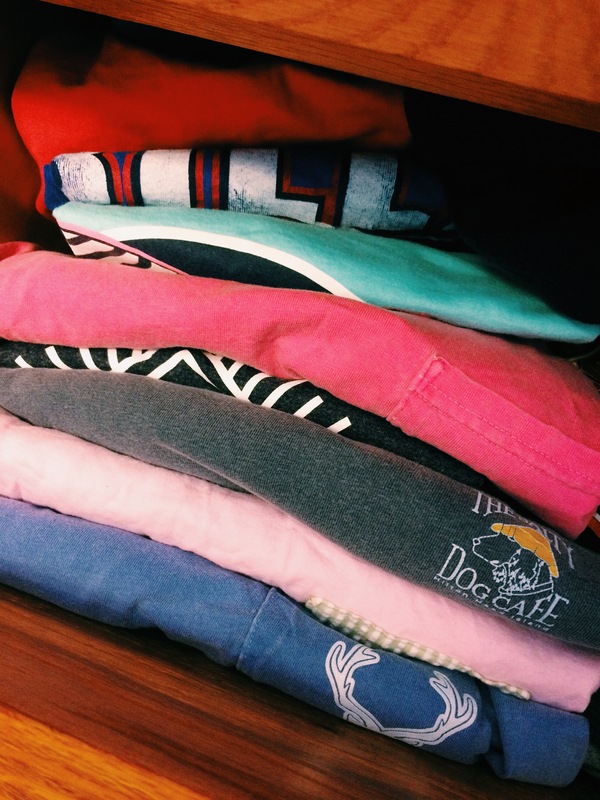 It saved so much space and allowed me to have way too many shirts at school! My boyfriend even loved the idea so much he did this to his drawers too! Thank you so much for reading! 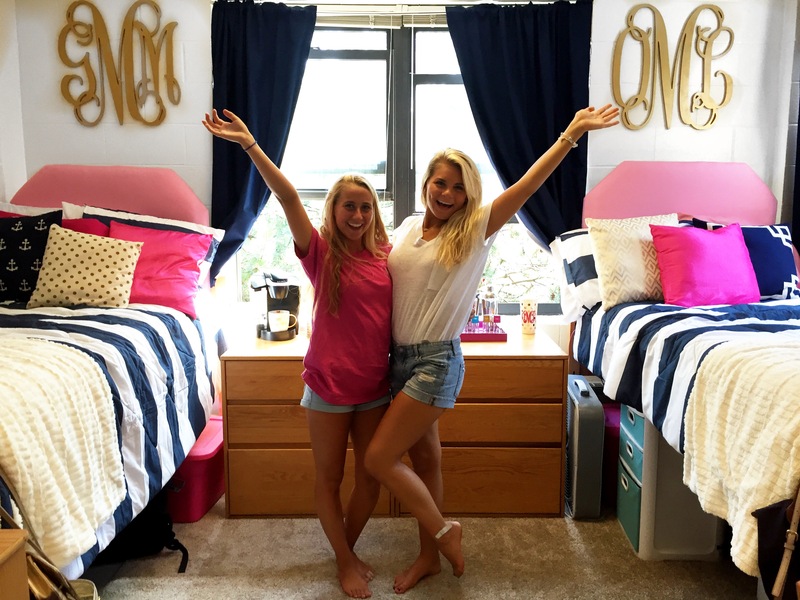 I hope you enjoyed peeking into my dorm room for a little!